Most people who go to snowy ski towns in the winter are packing some serious hardware and planning on enjoying the slopes. Call me boring but I don’t want to risk breaking a limb while on vacation in the Swiss Alps. 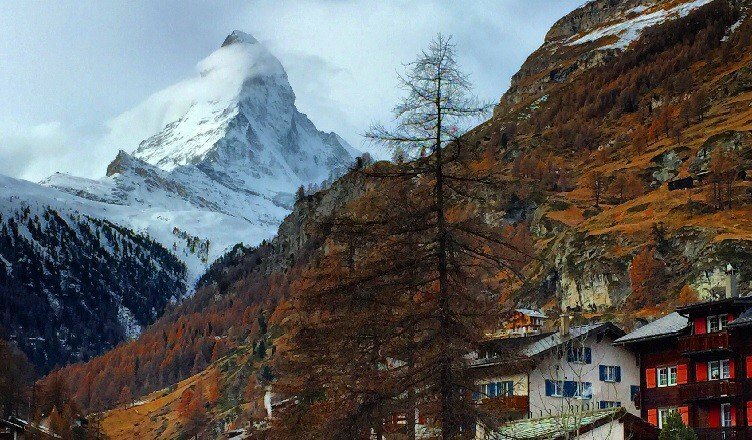 So I went to Zermatt to simply enjoy the town and to get a look at the Matterhorn. Getting there is in and of itself a worthwhile experience. Zermatt is a car-less village and there is only one way in and one way out: the train. 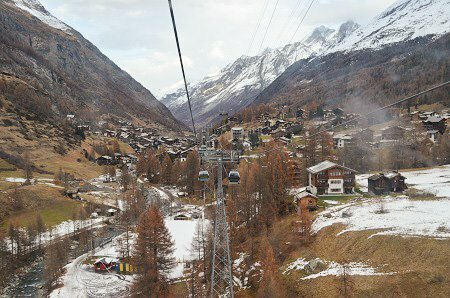 A ride on the Matterhorn Gotthard Bahn takes you from Visp into Zermatt. If you’ve ever wondered what it might feel like to ride the Hogwarts Express into the castle, this is probably as close to is as any Muggle is going to get. Except that as the train approaches town, instead of a castle, you start to see the Matterhorn outside of your train windows. Once in town, you can enjoy all sorts of ski-adjacent activities without the expense or potential injury of the winter sport. The Gornergrat Bahn, also known as the Matterhorn Railway, takes you up the rocky ridge for spectacular views of the Matterhorn and the other surrounding mountains. If you want to get even closer to the majestic summit, you can take the cable car from Matterhorn Glacier Paradise. This can be exhilarating (if the weather isn’t so great, it can also be terrifying.. but in a fun way) and with several stops along the way, you can enjoy hiking, food and of course, breathtaking views everywhere the lift takes you. While on the subject of hiking, if barreling down a mountain at high speeds doesn’t sound like your idea of fun, you can enjoy the snow and the outdoors on foot. You can wander on the hiking trails at the foot of the mountains or in Zermatt itself. You can visit the old town of Hinterdorfstrasse which gives you a glimpse at how people lived there centuries ago. The narrow streets are lined with wooden houses and sheds. If you’re looking for a more contemporary experience, there’s shopping, dining, and drinking to be had in Zermatt. Though many stores cater to the snow birds, you can find unique gifts and delicious chocolates in the shops of the city. If you want a good meal, remember that Zermatt is short mountain climb away from its Italian neighbors to the south. And trust me, the Italian cuisine crossed the border. Though much more expensive than food in Italy, you can get pizza and pasta of the same caliber in many places in city center. Restaurants can get very busy, especially in ski season, so try to get reservations whenever possible. When you’re done with all that fun stuff, you can cozy up in a hot tub or in front of a fire to keep warm. Your ski town vacation doesn’t get better than that.